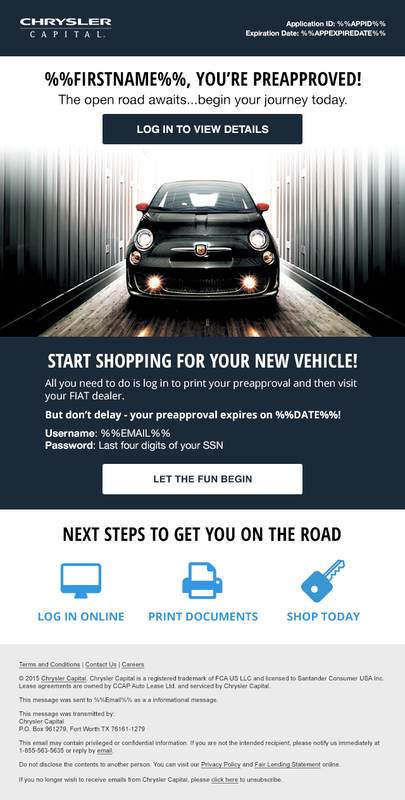 While at Santander Consumer USA (SCUSA), I designed and developed emails for all of their campaigns for all of their product lines, including SCUSA, Chrysler Capital and RoadLoans. After moving to the web team, I continued to consult on email, working with two designers and two developers. SCUSA is at the forefront of email design and development. Their capabilities are nearly limitless, technologically. There are hundreds of campaigns per year, per brand, with well over a million emails sent, annually. Looking to move the needle, even with basic account-related emails. Internal Use, Dealer and Customer emails. Within those categories, there were several subcategories, such as Originations, Promotional, Loyalty, Informational, Newsletters, Servicing, among others. User demographics generally spanned all age groups across approximately 50-60 ESPs. Emails to dealers were generally limited to many, many versions of Microsoft Outlook (even Lotus Notes! ); Emails to customers generally fell in a Yahoo!, gmail or Hotmail bucket. Besides competitive analyses, the primary form of testing was through analytics and user-centric data provided via Google Analytics to drive further changes and future enhancements––or through A/B testing. We utilized analytics tools and information to calibrate design and coding for maximum audience effectiveness. Moving at breakneck speed, while maintaining visual standards, often led to a demanding pace. However, I always pushed process and collaboration among cross-functional teams––between designers, developers, copywriters and product owners––to ensure that we were on the same page. And then there were the moments of rapid prototyping to push boundaries or die trying. In the screen capture below, there were at least 6 separate versions of the video edited by an extremely talented video crew before we could get the right animation in the appropriate file type and a digestable file size––and we pulled it off with a little elbow grease and a lot of teamwork. It's better to beg for forgiveness, than to ask for permission. It was my primary goal to develop rich UI designs for all of the company's business lines and products. In addition to following brand guidelines, I again sought to challenge the status quo of what already existed and designed for the future. As emails from an auto finance company are generally not the most interesting, I wanted to add an edge, as well as design emails which were extremely easy to code. Creating modular designs was vital, especially to be mobile-responsive. After only a short period of time, the emails produced had energized and strengthened existing brands through effective email design and implementation, using HTML/CSS/jQuery to code mobile-responsive emails and best practices. The Best of the Blog series, a collaboration between the copywriters and I, tallied an average of 51,000 visits per day over the course of 3 days following the launch, whereas average daily blog visits ranged from 100-200 users. In addition, Opt Outs were at an all-time lows in the past 3 years. Because of collaborations and relationships I had built with the teams in the department, I was able to bring elements of storytelling, subtle animation and micro-interactions to mediums that were otherwise static. I'm thankful for a team that was fostering my creativity and encouraging me to take risks.